Step one: put out crates on couch. Step two: remove cat from crate. 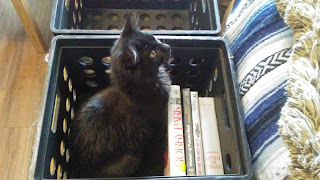 Step three: pick up books to put in crate. Step four: remove cat from crate. My guy is 15 and still loves to play inside a crate---it has holes that a paw can be stuck through to bat at people who walk by, cause he can peek through the holes but you can't see him. Cardboard boxes with flaps are fun also--he leaps up as you walk by flipping the flaps. The dogs used to go ballistic barking at the box that tried to attack them. Funny as all get out. Rev Paul - why sir, you sound like you've done this before! Suz - my two haven't picked up those habits yet (though a box on its side is an invitation to ankle ambush), but give them time!